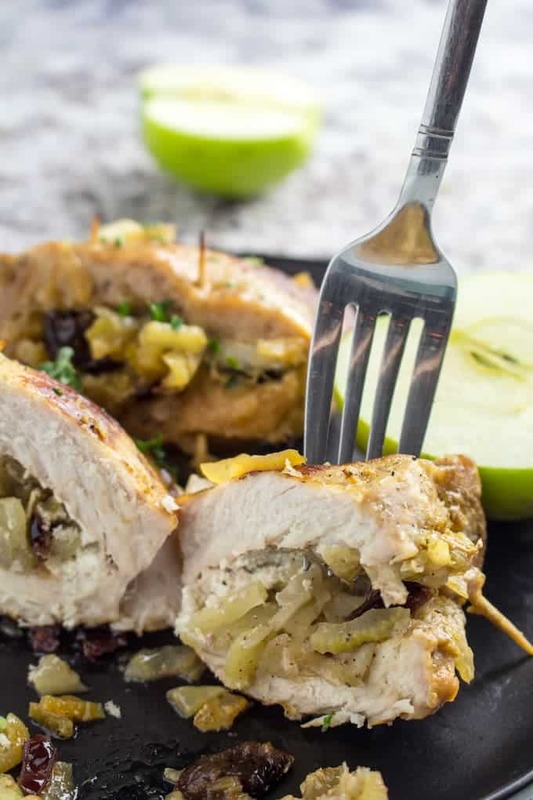 Baked Apple Stuffed Pork Chops are thick cut boneless pork chops stuffed with goat cheese, apples, and cranberries, seared on the stove top then finished in the oven. They look fancy, but they’re super easy to make, and perfect for a holiday dinner! I’m in a pork chop kind of mood today! Check out my Slow Cooker Pork Chops & Potatoes and Instant Pot Pork Chops! 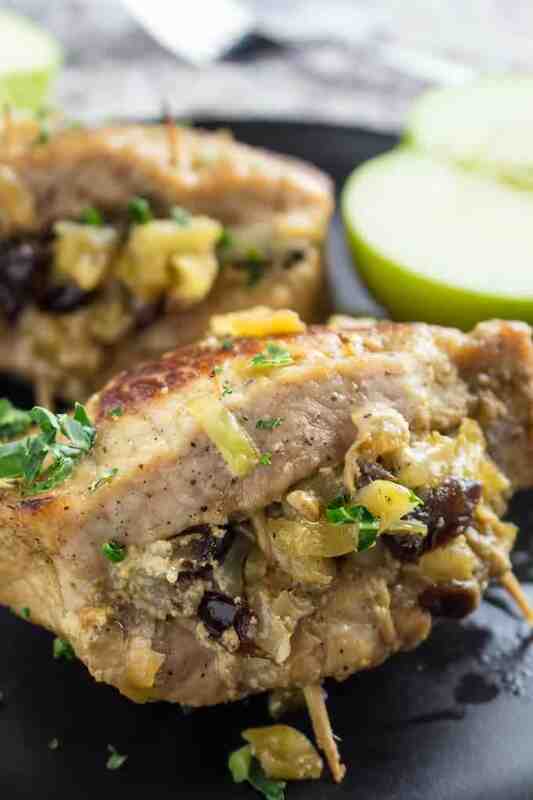 Baked Apple Stuffed Pork Chops are a savory meal the family will love. It blends the sweetness of apples and cranberries with the tangy goodness of goat cheese. I particularly love this recipe when apple season rolls around, because it’s one more thing I can do with all of the extra apples in my house! Plus this dish is just easy enough that anyone will be able to make it, but just fancy enough to serve for a holiday dinner party. Because nothing says the holidays are here like cranberries! Cooking stuffed pork chops is a lot less intimidating than it seems! And trust me, if I can learn how to make stuffed pork chops, you can, too. First you need to sauté your onions, celery, and apples in some butter until they’re soft. See, it’s not so bad yet, right? Once that’s done, remove it from the pan into a bowl and set aside. Next you take your thick cut pork chops flat on the cutting board. Use a sharp knife to cut a pocket into the chop. Only cut through one side, leave the other three intact. Evenly distribute the goat cheese among the pork chop pockets. Then do the same with the stuffing. Close each chop with two toothpicks (you can see what I’m talking about in the photos here). Put more butter in your dutch oven, then sear the chops on each side. Pour over the glaze, and bake! That’s it! It’s not so bad. As long as you can stuff a chop, you can make this recipe. 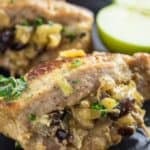 How do I make the stuffing for apple cranberry stuffed pork chops? 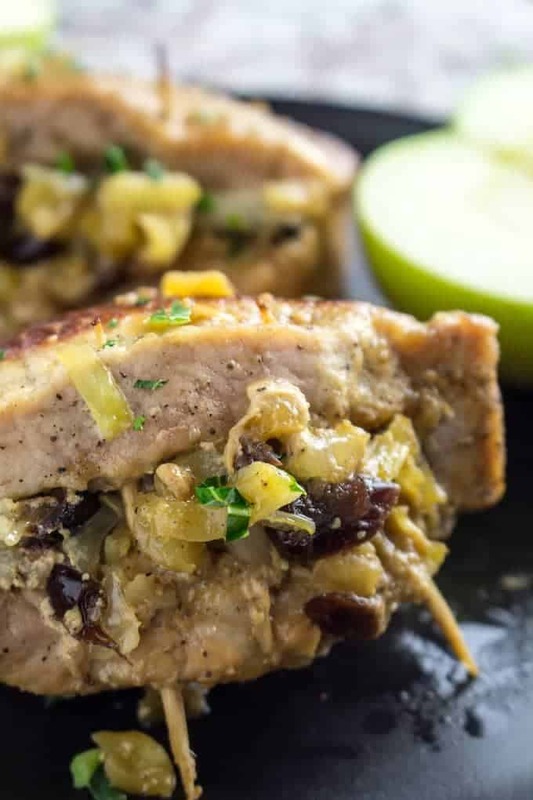 The stuffing for apple cranberry stuffed pork chops is really simple, but there’s a few different ways you can go here if you want to get creative. Go the traditional route, like I did here. Goat cheese, onion, celery, and craisins. Simple yet sophisticated! Throw in any root vegetables you happen to have on hand! I love turnips, carrots, and parsnips myself. Get creative with your spices. There’s no reason we can’t have a garlic and parmesan pork chop instead of goat cheese and craisins! 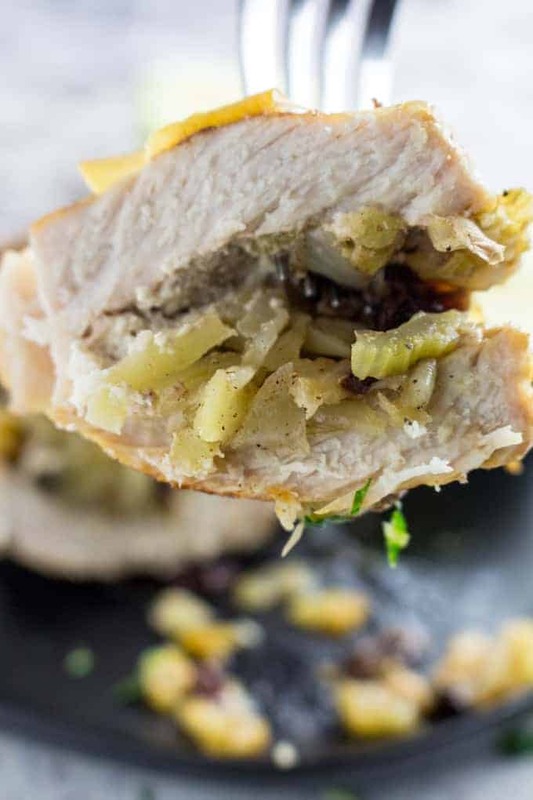 Stuffed pork chops are thick cut to begin with and then stuffed even more, so you’re going to want to bake these covered for at least 40-45 minutes. Your best bet is to use a thermometer to make sure they are at the right temperature before removing them from the oven. There it is, now you know how long to cook stuffed pork chops! What should the internal temperature of stuffed pork chops be? Pork chops should be cooked to 160F in the innermost part of the chop. I keep a handy kitchen thermometer around at all times to make sure my meat is cooked right. This ensures that what you’re eating is not only tasty, but it’s also safe! Which is especially important for baked stuffed pork chops, which may take a little longer to cook than you’re used to. Stir together apple juice, cornstarch, and brown sugar in a small bowl or mixing cup. Pour glaze over pork chops right before they go in the oven. Spoon some of the glaze over the pork chops right before you serve them. Serve this glaze over pork chops and enjoy this sweet and savory meal! I like to serve it with Creamy Garlic Parmesan Mashed Potatoes. Do you cover baked stuffed pork chops when baking? Yes! Place baked stuffed pork chops in the Dutch oven with the lid on for 45 minutes. This helps them cook without burning any of the sugary goodness we have going on in there. 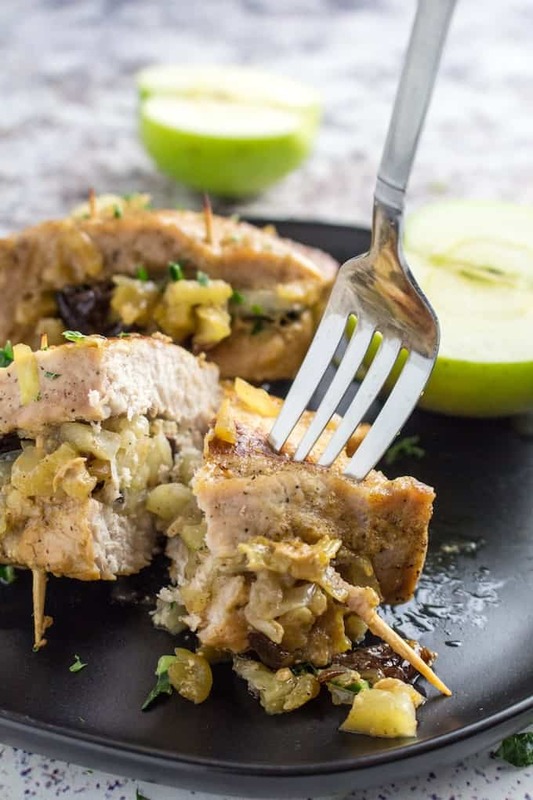 Baked Apple Stuffed Pork Chops are thick cut boneless pork chops stuffed with goat cheese, apples, and cranberries, seared on the stove top then finished in the oven. They look fancy, but they're super easy to make, and perfect for a holiday dinner! In a dutch oven over medium heat add 2 tbsp butter and onion. Cook, stirring frequently, until caramelized, about 5 minutes. Stir in apples, celery, craisins, and seasonings, cooking until softened. Pour in white wine and cook another 2-3 minutes until wine cooks off. Remove from dutch oven into a bowl and set aside to cool. Placing each chop flat on your cutting board, use a sharp knife to cut a pocket from the side. Go as far as you can without cutting through the other sides. Stuff each chop evenly with goat cheese, then apple mixture. Close with two toothpicks per chop, one on each end of the pocket. Add 2 tbsp butter to to dutch oven and sear the chops for a minute or two on each side. In a small bowl whisk together pineapple juice, cornstarch, and dark brown sugar. Pour over pork chops. Put lid on dutch oven and transfer to the oven. Bake 40-45 minutes, or until chops are cooked through. Flavor was good but cooking time of 40 min is much, much too long. Next time I’ll try 30 min at 375. Will make again because flavor was pretty good.